Flange insulation sets comprise an electrically insulating flange gasket, plus insulating bolt sleeves and washers to prevent conduction through bolts. 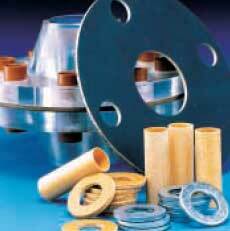 They are used in cathodic protection systems and to eliminate galvanic corrosion. Long distance pipelines for water, oil or gas that operate at temperatures up to 120°C. Washers: reinforced phenolic or plated mild steel. Sleeves: polyester or DuPont Mylar®. Four designs of set that cater for many different flange sizes, specifications and arrangements – including those with ‘O’ ring grooves or handling very high pressures.